I didn't find any thread generally addressing the music of Bartok (numerous threads addressing a particular work, especially the Concerto for Orchestra). I've been listening to this set. It contains most of Boulez's Bartok recordings for CBS. (Paradoxically the Concerto for Orchestra with the New York Philharmonic is omitted, and I had to pick that up separately). 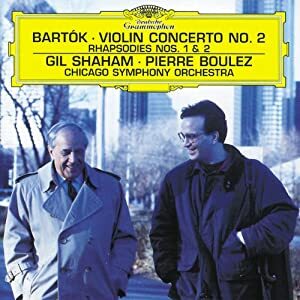 I got very little pleasure from Boulez's set of Bartok recordings on DG because the audio engineering did not appeal to me (too intrusively engineered, strident, and lacking in natural audio imaging). Most of these old Columbia recordings sound fabulous and Boulez's interpretation is inspired. Today I listened to the Wooden Prince. Wow, an amazing work. This is early Bartok when his music seems to flirt with the impressionistic pallet of Debussy and the bright colors of Stravinsky. There are so many wonderful harmonic and orchestral effects in this music. I find it similar to the Miraculous Mandarin and the Four Orchestral Pieces in that way. Boulez does his magic, producing a sound which is both voluptuous and transparent. Just gorgeous! To much to absorb at one sitting, I must listen again. My response to the sound DG gives Boulez is just th opposite ; I thought the DG sound was much better, free from the kind of dry,grayish sonics which are the bane of so many of this label's recordings, not just Boulez, but Bernstein, Szell, and other conductors .. There's much more color and atmosphere on the DG recordings . I agree with THEHORN. I've never liked Columbia's sound, which is unfortunate considering the stable of conductors they had in their heyday. These are just off the top of my head. There are numerous great interpretations of these works: Anda/Fricsay in the Piano Concertos, Szeryng in the 2nd Violin Concerto, and of course Reiner's disc coupling the CFO and MFSP&C is a must-have. Don't miss his chamber works and solo piano works. There are some real gems to be found. Zoltan Kocsis has a great complete set of the piano works, and there are several excellent recordings of the Quartets, such as sets from the Hungarian quartet (DGG) and the Takacs quartet (Decca). I have both sets complete and it is like choosing apples and oranges. Boulez and Bartok are a match made in heaven. DG and Sony have given us treasures to cherish from early in Boulez's conducting career with Sony and later on with DG. If you love Bartok, either or both sets are essential listening, m8. P.S. Do not forget Boulez conducting Debussy and Ravel. Fabulous DG reissue box coming soon. As for DGG's sound, I also agree that it's better than Columbia's mix-down from quadrophonic. Boulez's "Wooden Prince" on DGG is excellent, IMHO, but his other readings on that label (whether it's Bartok, Stravinsky or Mahler), just don't gel for me: he seems uninvolved, just doing a read-through. His Columbia recordings, OTOH, show a younger self that is more involved emotionally and technically, so I prefer to listen to those. Pierre Boulez involved emotionally? For all the good qualities of his conducting, in some repertoire at least, this is one I don't think I've ever perceived. But you've probably heard more of his recordings than I have, and possibly attended more of his performances. John F wrote: Pierre Boulez involved emotionally? For all the good qualities of his conducting, in some repertoire at least, this is one I don't think I've ever perceived. But you've probably heard more of his recordings than I have, and possibly attended more of his performances. 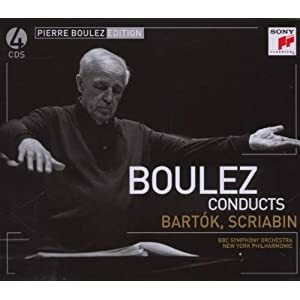 Boulez's conducting style in his earlier recordings of Debussy and Bartok appeals to me. He's not fussy, but he's concerned with the quality of the music. His sense of tempo and discipline when he was trying to prove himself as a rising star didn't last long, but IMHO it was there, briefly. A cellist friend who played in Cleveland back when Boulez was first emerging as a guest conductor related to me that Boulez, in rehearsing the Brahms First Piano Concerto, tried to conduct the first movement opening in a broad two. Naturally, everything fell apart, until Boulez stopped, and someone stage-whispered to him "It's done in six, maestro." Boulez had an "AhA" moment, proceeded to conduct in 6, and it worked perfectly. This has been his problem in Romantic music from the beginning: he doesn't feel the tempo viscerally, physically, which is why he tends to stick to XXth Century repertoire, where everything is marked by a metronome number. Thus the intellectual approach to music, at least in his case, fails to satisfy me in his Mahler for instance, and in many of his later discs, which, indeed, sound like read-throughs. De gustibus, I suppose, but there it is. Not to be too much of a control freak, but the topic is Bartok. There must be a Boulez-hater thread on the board where this venom can be drained. Listened to another rather obscure work of Bartok, "Two Portraits." This is a relatively early work and the first of the two movements is based on a violin concerto that came to light some time afterwards. It consists of two treatments of the same theme, the first "ideal" the second "grotesque." The first section is a wonderful piece. It starts with a solo violin, then other solo strings enter in a slow fugato, until the entire string section is participating. Finally the full orchestra is engaged. The second movement is fast and quick with snappy rhythms and brilliant orchestration. 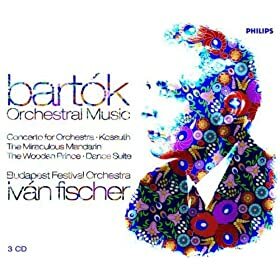 The fact that the Philips Fischer/Bartok is out of print is absurd. I have two of the three discs in the set and they are utterly superb. What I wouldn't give to have his "Wooden Prince" which is impossible to find, even used. nut-job wrote: I made the mistake of trying to listen to Ansermet's recording of this piece, which is a dreary mess. TAlso listened to the famous Music for Strings, Percussion and Celesta by Ansermet. He had trouble entirely ruining it, but make a Herculean effort. Although by-and-large a big fan of Ansermet's, I must agree about his Bartok recordings. I have a two-disc Eloquence set with Ansermet conducting a number of Bartok's important works. Unfortunately I think the music is simply too much for the OSR, which was never considered a virtuoso band by any means. 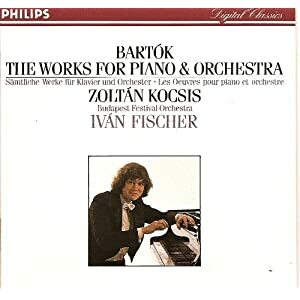 The fact that the Philips Fischer/Bartok is out of print is absurd. Agreed. I didn't realize it was OOP until maestrob chimed in. It seems inconceivable to me that such an excellently interpreted and recorded set would not be perennially available in the catalog. ContrapunctusIX wrote: Although by-and-large a big fan of Ansermet's, I must agree about his Bartok recordings. I have a two-disc Eloquence set with Ansermet conducting a number of Bartok's important works. Unfortunately I think the music is simply too much for the OSR, which was never considered a virtuoso band by any means. I'm also a fan of Ansermet, but these performances fell flat. He seems to be at is best with orchestration that sparkles and rhythms that dance. His Petrushka may be my absolute favorite. But it wasn't working for him here. And the orchestra did not help. The brass timbre in the famous fugato in the first movement of the Concerto for Orchestra was downright comical. Perhaps fell victim of the new regime, where Philips and Decca have been merged. They seem to regard Solti as their Bartok guy, and have little incentive to give him competition. nut-job wrote: Perhaps fell victim of the new regime, where Philips and Decca have been merged. They seem to regard Solti as their Bartok guy, and have little incentive to give him competition. Interesting choice. I like Solti well enough in Bartok, but there are better interpreters out there. He tends to railroad the music and I don't think it's always the best approach for this composer. I consider several others (Fischer, Reiner, Dorati and Fricsay) to be artistically superior as Bartok interpreters. I certainly hope Universal doesn't pare down their catalog too badly. Decca, Philips and DGG could all produce excellent sets as separate entities. "Streamlining" in this case is not preferable! Well, you gotta admit Ansermet did what was possibly the bounciest, friskiest, most impetuous performance of the Roumanian Folk Dances ever! In my book that accounts for something. ...and frankly I find it ironic that Ansermet's Bartok should be thus slammed on this thread. Ansermet especially espoused Bartok's last works, considering them "among the most beautiful tokens of hope the music of our time has produced." Last edited by Wallingford on Wed Mar 28, 2012 1:23 pm, edited 1 time in total. Wallingford wrote: Well, you gotta admit Ansermet did what was possibly the bounciest, friskiest, most impetuous performance of the Roumanian Folk Dances ever! Didn't get that far. His recording of the second movement of "Two Portraits" (the "freaky one") was indeed very good. The rest, I give an E for effort. The OSR was often criticised for its less than perfect playing and ensemble, but Horst Stein managed to coax excellent results from them in his acclaimed 1972 discs of Sibelius Legends and tone poems - a hell of a feat considering the unpopularity of Sibelius in the Francophonic world! Just how did Stein manage it? Perhaps he said " We have ways of making you play!"? Perhaps you should say, Stein and the Decca producer and technicians of the recording sessions. Stein was not one to work his musicians hard; he once chose to conduct "Parsifal" at the Vienna State Opera without any rehearsals at all. In 1972, the OSR's music director was Wolfgang Sawallisch, not a permissive conductor, and perhaps he had gotten the orchestra into shape. Stein succeeded him in 1980 and stayed only five years. I'll be giving up my Rhapsody service soon--BUT NOT before I investigate a live Concerto For Orchestra Ansermet did with the BBC orchestra, given its first release in the BBC label's ongoing series. I'll report back on it; hopefully it gives a more favorable picture of Ansermet's vision of this music. Wallingford wrote: ...and frankly I find it ironic that Ansermet's Bartok should be thus slammed on this thread. Ansermet especially espoused Bartok's last works, considering them "among the most beautiful tokens of hope the music of our time has produced." I listened to Ansermet's CFO again after this comment, just to see if I was mistaken, and it's not good. I stand by my comments, but I reiterate that I put most of the blame for the lackluster results on the orchestra rather than Ansermet. They are simply not capable of executing his vision. Well, since Ansermet was the founder of the orchestra and its music director for its entire history up until that point, I don't see how that deflects responsibility from Ansermet. The OSR did just fine with similarly prickly repertoire in the past (Honegger's second symphony, Stravinsky's Symphony in C). My problem with is "Two Portraits" is that he has them play it totally straight, uniform phrasing and articulation. Dorati's recording contains lots of expressive touches which highlight significant points in the harmonic progression. Similar problem in the opening movement of the Music for Strings, Percussion in Celesta. The issue for me is that Ansermet's interpretation is too neutral. I just received the Honegger 2nd,3rd and 4th Symphonies from Epoquence Australia. I can't wait to hear Honegger's 2nd again years after I last listened to the original London(Decca) LP. Would you believe I have happily collected every single one of Ansermet's Eloquence reissues? The eminent Swiss conductor was a great part of my musical education back in the 50's. I think he is one of the podium titans of the 20th century. stenka razin wrote: I just received the Honegger 2nd,3rd and 4th Symphonies from Epoquence Australia. I can't wait to hear Honegger's 2nd again years after I last listened to the original London(Decca) LP. I have the 2nd and 4th, they have long been available on CD, but never the 3rd. That's a really difficult piece, I wonder how they manage on it.